Summer camp was one of the most memorable experiences of my childhood. I was 11 years old and my mom enrolled my sister and I at a local Christian camp. My cousins were also there along with a few of my neighbourhood friends. It was like one big reunion. I met so many new friends and had a blast playing sports, hiking and swimming. Every night around the bonfire, the campers would perform skits. I was so sad when the week ended and even today looking back, the memories make me smile. My oldest daughter has been attending the same camp for years and looks forward to going every summer. I’m waiting a few more years and then my youngest daughter can also go and experience summer camp. She loves the outdoors and is a very outgoing child so I’m sure she will love it every bit as much as her sister. Inter-Varsity Summer Camps are Christian camps for kids age 5 to 17 and are located in Ontario, Manitoba, Alberta, Saskatchewan, and British Columbia. They offer a variety of specialty programs in leadership development, water adventures and horsemanship. Plus, there’s a ton of fun activities for kids to participate in like sailing, swimming, horseback riding and rock climbing. Their goal is to provide children the opportunity to learn, grow and develop through their camp experience. The Inter-Varsity Summer Camps sound like something my kids would enjoy. If I was young again, I’d want to go myself. I’ve always wanted to learn how to ride a horse. My girls are both athletic and I think would have a great time there. 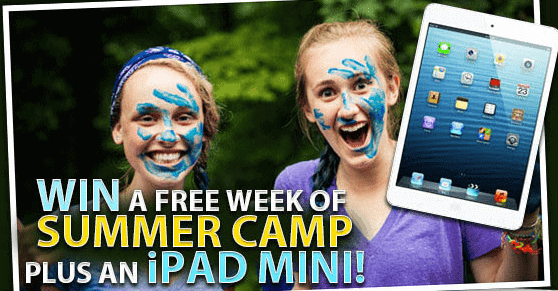 Inter-Varsity Camps is hosting a giveaway for a free week of summer camp and an iPad Mini! Just fill out the entry form to enter and share with your friends on Facebook, Twitter or email to earn extra entries. You will earn an additional ballot for each person who enters the contest using your link. As a bonus, you will receive a coupon for 15% off summer camp just for sharing! The contest is open to Canada only (excludes Quebec) and ends June 28, 2013 at 11:59 pm ET. Check out the contest entry form to enter and for more details including the rules & regulations. Good luck everyone! Disclosure: I was compensated for this post. However, all opinions expressed are my own. I loved summer camp when I was little. My daughter never liked it but my son is really enjoying it. Wish these were closer to Vermont! I have some of the best (and some of the worst) memories from summer camp. Wouldn’t trade them for anything. I didn’t go to Summer camp, yet my daughter is really excited to go next year, already researching them. Great post!! too bad im in the US! Let’s have a camp contest for the USA commenters. Summer Camp is a great opportunity for children to meet new friends and try new things.